1 SANITRON® Model S10,000C through S25,000C come equipped with mounting rack. 2 MIGHTY★PURE® MP36C and MP49C are available with NSF®/ANSI 55 for Disinfection Performance, Class B. 3 SANITRON® Models S37C, S50C, and S2400C are certified to NSF®/ANSI 61 & 372. Model S2400C is used in modular form to build larger models. 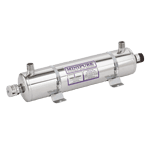 When used as directed to disinfect clear water, Atlantic Ultraviolet Corporation® water purifiers provide an ultraviolet dosage in excess of 30,000 micro-watt seconds per square centimeter (μWSec/cm2). This list depicts options for 120v 50/60Hz operation. Consult factory for options with other power requirements. Ultraviolet technology is well-established as the safe, effective, and economical method of choice for water disinfection. UV radiation is highly lethal to virtually all bacteria, virus, and fungi. 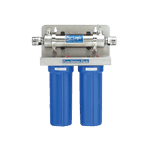 From small point-of-use applications to complex industrial water systems, we have a UV water purifier that will fit your needs. The compact design of the Bio-Logic® Pure Water Pack™ means that it requires minimal space. The included mounting bracket allows for neat and tidy installation under your sink. A sediment filter and carbon filter provide dual filtration prior to ultraviolet disinfection. This model also comes equipped with a stainless steel point-of-use faucet. MINIPURE® models are compact and require minimal space. They are ideal for your home, apartment, boat, RV, vending machine, or office. 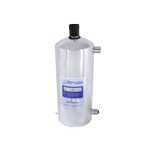 Ultimate™ water purifiers are designed for a vertical installation, allowing for connection in spaces that are too tight to accept a horizontally mounted purifier. Several models are available to handle most small water requirements. Typical applications include homes, laboratories, and water vending. MIGHTY★PURE® models offer superior quality and numerous standard features. They also have several optional accessories, including but not limited to an Ultraviolet Monitor. These models can be utilized with many applications, including home water wells, laboratories, farms and ranches, boats, campgrounds, and restaurants. NSF® Certified systems are available. SANITRON® models are of exceptional value, designed to conform to U.S. Public Health Guidelines “Criteria for the Acceptability of an Ultraviolet Unit.” Each model is well-featured and can utilize a number of different optional accessories. Applications include process facilities, home water wells, restaurants, schools, mobile homes, swimming pools, fish ponds, hospitals, laboratories, resorts, hotels, and medical facilities. Model S2400C is available with alternate inlet/outlet fittings. SANITRON® Models S37C, S50C, and S2400C are NSF/ANSI 61 & 372 Certified. 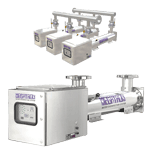 The MEGATRON® enables you to interconnect multiple units for virtually any flow rate. Millions of gallons of water can be purified for pennies of operating cost. Many of the optional features seen in our other UV water purifiers can be found standard in the MEGATRON®. A patented, Dual-Action Automatic Wiper Mechanism is available as an optional accessory, enabling automatic quartz sleeve cleaning once programmed.